When I began turning, it was for a living and I needed something small that would sell well and provide cash flow as well as essential skew chisel practice. I came up with light pull knobs and scoops.Throughout the 1970s I sold at least fifty scoops a week and they paid all my basic bills. They were turned mostly from the split ends of the boards from which I cut my salad bowl blanks. 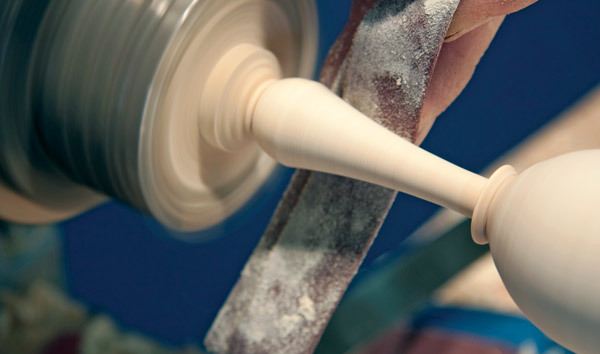 Scoops provide practice for hollowing endgrain and for using the skew chisel as you turn the outside, and there’s an approach to measuring that ensures you achieve the reasonably even wall thickness that makes or breaks how a scoop looks. The inside is wider than the opening, so cannot be shaped with a drill. Scoops that are drilled out have nothing like the appeal of these more curvaceous cousins. Scoops generally look best when the internal depth is very slightly more than the diameter of a tulip-shaped bowl. You can vary the length of the handle—scoops for sugar or salt bowls are best with reasonably long handles, whereas a flour scoop likely to be dipping into a large store pot can have a short handle. My wooden scoop is a sort of footless, sawn-off goblet, and it’s not quite as easy to make as it might look. It was widely copied even before it was a project in my first book and video, but few people seemed to grasp that the belly of the bowl is wider than the opening and that this has to be turned. The grain runs parallel to the lathe axis for strength. There needs to be plenty of wood where the handle joins the bowl. Aesthetically this mass looks a lot better as a bead between the handle and the bowl rather than a very thick base to the bowl. If the back of the bowl, where it meets the handle, is too steep, the grain is short and likely to break with any lateral force. Below are the tools I generally use for turning scoops. When turning any hollowed endgrain project, hollow the inside before doing any external shaping so you retain as much strength as possible from the overall blank for as long as possible. 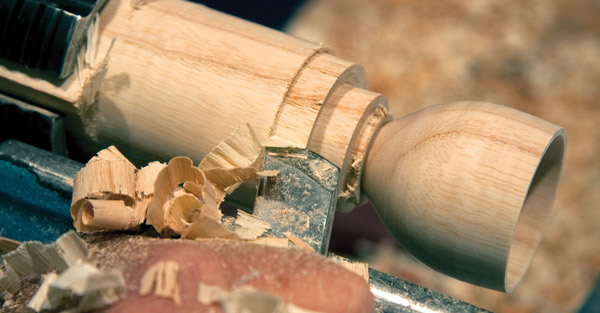 If you shape the outside first, any outward pressure as you cut is likely to split the wood (remember that the grain lies parallel to the lathe axis). An ideal starting blank is about 50mm2 x 140mm long. Longer jaws, like the Vicmarc Shark Jaws used here, will grip a square blank securely. 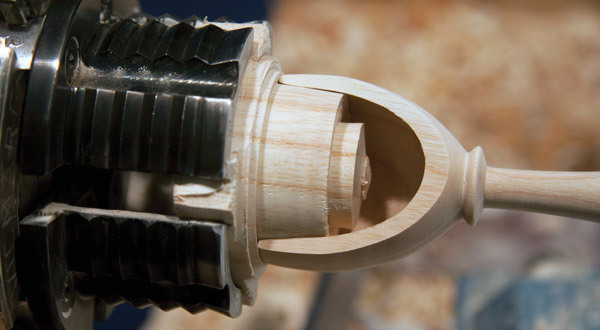 But if you are new to hollowing into endgrain, there’s a good chance you’ll heave the blank out of the chuck, so for the most secure grip, turn the blank to a cylinder between centres. Put a tenon on one end and a shoulder that butts up against the rim of the chuck jaws. First true the blank (photo 1). Even if the blank looks as though it’s running true it probably isn’t. On a square this size I use a skew chisel all the way, but you might feel more comfortable using a roughing gouge initially, before you grab the skew chisel for the final smoothing cuts. 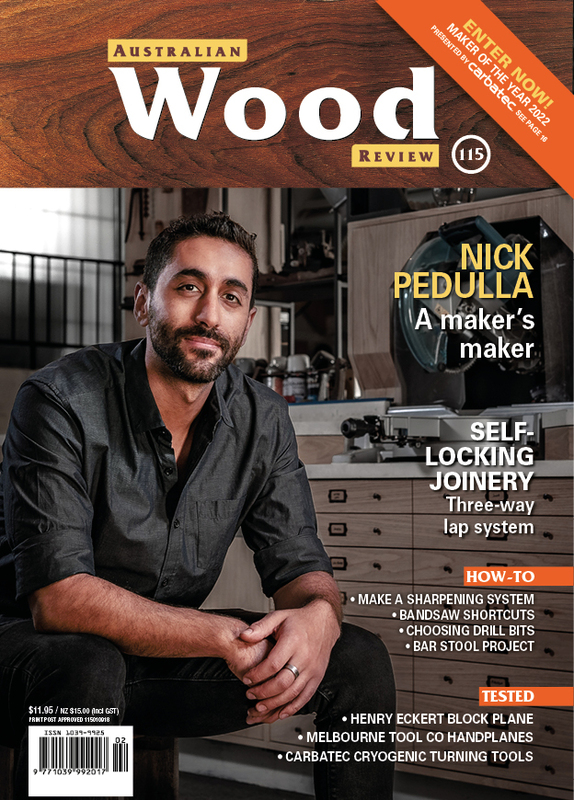 Now is a good time to find out how the wood is working with the tool you’ll be using to make the final shaping cuts. Don’t forget the endgrain (photo 2). Use the skew with long point down across the grain and then you can see what you’re doing. When using the point, only the bevel side should be in contact with the wood. When the endgrain is smooth, drill a depth hole slightly deeper than the diameter of the blank (photo 3). 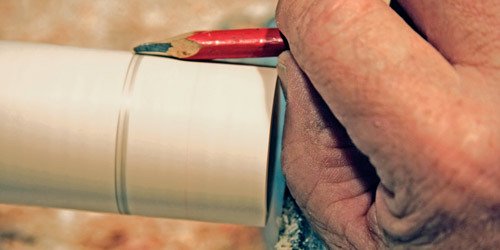 You can remove the bulk of the waste by drilling (which is slow) or by using gouges or scrapers. By far the quickest method is to back-hollow with a spindle gouge, cutting away from centre at about two o’clock (photos 4 and 5). For this cut you need to keep the opening of the hollow small as you remove the bulk of the waste. Using both the rest and the rim of the opening as a fulcrum, you start the cut at centre with the tool on its side, flute towards centre. Roll the tool slightly clockwise to pick up the cut, then ease the handle towards you or lower it. This is not an easy technique to learn but very satisfying once you’ve got it, when three swings of the handle will remove the bulk of the waste in not many more seconds. As always, don’t push the tool into the wood, but let the wood come to the tool. A much easier way of hollowing is to use an asymmetrically ground scraper to widen the depth hole (photo 6). Set the rest so it is on or only slightly below centre. You need the rest high enough that the bottom left side of the scraper can’t contact the rim of the opening as you hollow. If the rest is too low, the tool rides on the lower side and you need to tilt the tool up to get the edge cutting, and that leads to major catches on the endgrain. Use as large a scraper as you can fit in the hole. Here I use a 25mm wide tool 9mm thick, and find that creating a smooth curve is much easier if the radius of edge is only slightly tighter than the curve I’m aiming to turn. 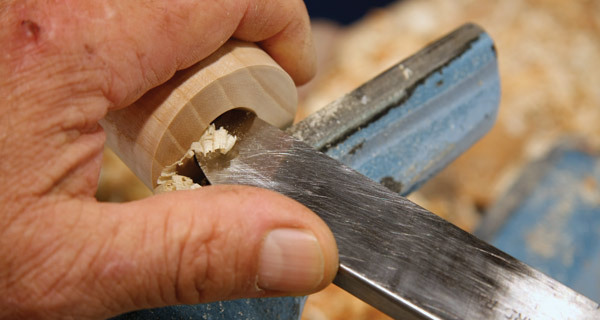 Use only a small portion of the edge at once: scrapers are not moulding or profile cutters, so if you get the whole of the edge in contact with the wood at once it will grab. Chances are you’ll have a problem getting rid of a bump at the bottom of the bowl. Don’t push the tool forward to remove this: set the tool rest so that when the edge is on centre the scraper tilts down. You don’t want the edge tilting up into the endgrain. Then all you have to do is pivot the edge through centre from below by easing your weight on the end of the handle. This action takes the nose of the scraper through a small arc rather than forward, and the bump should vanish with very little pressure or effort. With the inside turned, mark the exact depth of the hollow on the outside (photo 7), then sand the inside. You sand the inside before you start on the outside because if you sand both inside and outside together, the rim can become dangerously sharp and you can slice yourself severely. Also, sanding removes a lot more wood than you might imagine, so the precise thickness of the bowl wall is difficult to control. With any turning that’s hollowed, it’s usually a good idea to sand one side of a wall before you begin to complete the other. On a salad bowl I would sand the outside before hollowing. Always establish one surface or profile and then work in relation to that. The bowl wall needs to be of reasonably even thickness to look good. It’s important to know the exact depth of the inside, so mark this on the outside and then make a parting cut against the headstock side of that line (photo 8). Do not make allowances or add a bit for safety, as that’s a good way of losing track of exactly where the inside depth is. Your point of reference will be the headstock side of the parting cut, and you know the inside depth is the width of the parting tool from the headstock side of the parting cut. 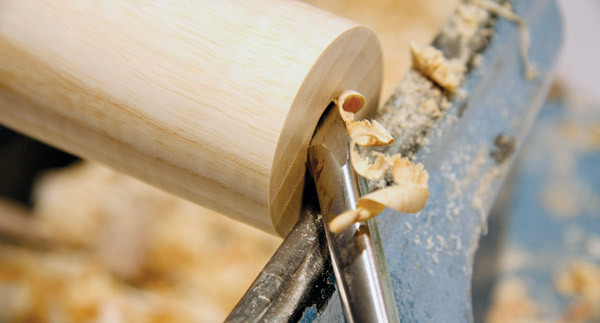 Use a parting tool at least 3mm wide and leave about half the diameter. The outside is best shaped using a skew chisel (photo 8). Start with the skew long point up, then flip it over (photo 9) to use the long point down the back of the bowl across the endgrain. 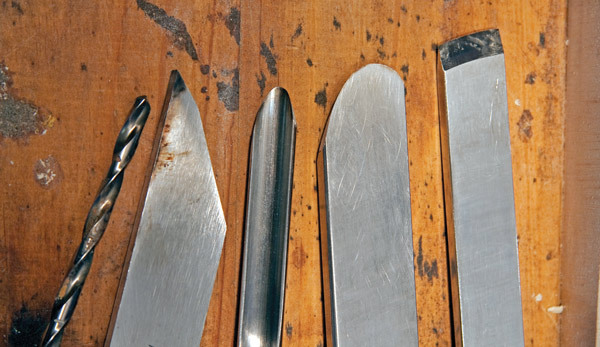 Many turners are nervous of catches when using a skew chisel, but the good news here is that you can afford one catch—provided it’s in the right place. You cut away the damage to create the scoop. As you form the back of the bowl, be sure to retain some of the parting cut as that is your point of reference. If you project the curve towards the point where the left side of the parting cut would intersect with the axis/centre, you should end up with a near-even wall thickness. Another way of gauging wall thickness is to drill a hole in the portion you’ll remove to turn the goblet into a scoop, and then you can actually see it. As you turn the handle, the main thing to remember is that you need a bead against the bottom of the bowl for strength, or a thickening handle. If you have a thin shaft of a handle running straight to the bottom of the bowl, the short grain at the bottom of the bowl will not be strong enough to prevent it breaking under the slightest lateral pressure. It’d most likely break on the lathe during sanding. 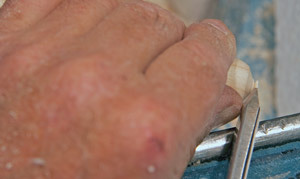 Rough down the handle using either a gouge or peeling cuts with the skew chisel kept flat on the rest (photo 10). The edge should be just below the surface of the wood, not pointing at the axis (which is scraping and likely to shove the work off centre). As you refine the handle, vibration tends to be a problem so you’ll need to support the work (photo 11). Your thumb is on the rest as it provides a lateral fulcrum for the skew (your right hand pushes the tool against your thumb), while your forefinger reaches under the rest to equalise any pressure you put against the wood as you cut. You can push quite hard if you can stand the heat, but most of us opt for minimal tool pressure against the wood. It’s that let-the-wood-come-to-the-tool stuff again. With the turning almost completed, sand the outside (photo 12) and then part it off. Use a skew chisel for the cleanest cut (photo 13) and go steadily so you don’t pull endgrain from the end of the handle. Let the wood come to the tool and the scoop drop into your hand. If all goes well all you’ll have to do is a bit of hand sanding to clean up your parting cut. If you need to turn the end of the handle, make a jam chuck. I keep a box of endgrain stubs for exactly this purpose. 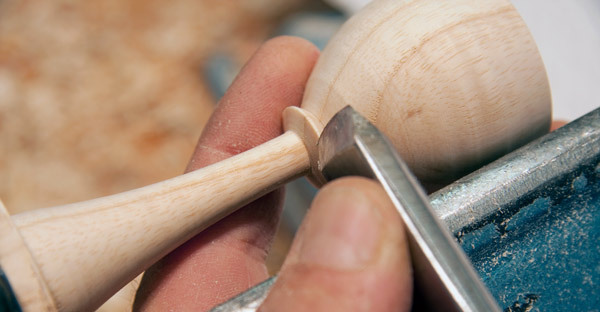 Turn a taper so the scoop just fits over the end (photo 14) and hold it just firmly enough to burnish the chuck. This is exactly the diameter you need, so reduce the taper to about half a degree from the burnish mark, then remove the burnish mark with an ultra-light peeling cut using the skew chisel on its side and ease the scoop onto the chuck. If you can get the rim of the scoop against a shoulder on the chuck it’ll be more secure. I had a bit of difficulty keeping this scoop on the chuck and in photo 15 below you can see why. The problem was that the hollow is almost a catenary curve that fits the chuck a couple of millimetres in from the rim. Had the internal curve been fuller, the scoop would have been easier to chuck. Whenever you’re going to mount a project over a chuck, it pays to ensure the inside widens rather than is some sort of catenary curve. Once the scoop is jammed on the chuck, you need to support the work whilst providing a fulcrum for the tool with your thumb on the rest as you complete the turning (photo 16). 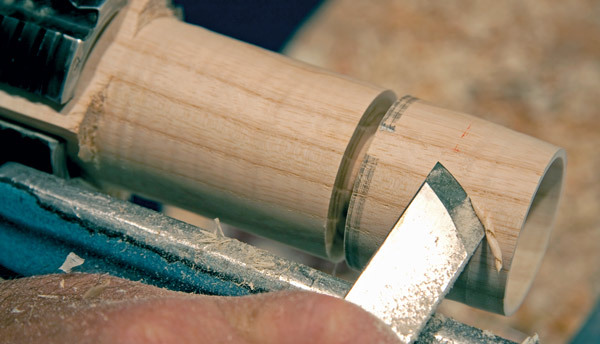 A spindle or detail gouge is a good substitute for the skew, using much the same grip. Expect the work to come off the lathe because the wood is just dying to roll up the edge of the tool. Remember that the closer to centre you cut the slower the wood is moving, so you need to slow the pace at which you move the tool forward. 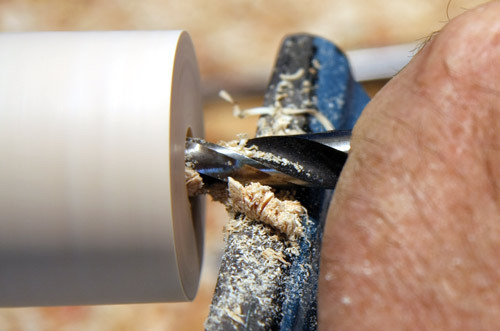 The safest way to remove a portion of the bowl to create the scoop is on a belt sander using first a 60 grit belt, then 180 or finer (photo 17). If you keep one finger on top of the bowl as you raise the handle, you create a smooth curve with ease. It’s very easy to remove too much and spoil the overall shape, so go warily. Sixty grit is aggressive and will grab a thin or weak bowl off its handle, so be prepared. The positive side is that this is a useful way of ensuring your scoops are strong enough for ongoing use. You’ll need to hand-sand away whiskers around the scoop rim. If you use a disc sander, keep the axis of the scoop parallel to the disk rim and remember that the outer wing will be sanded away faster than the inner wing, so you need to have slightly more pressure on the inner wing to keep the wings symmetrical. You might consider using a bandsaw, and I did when making scoops in production. 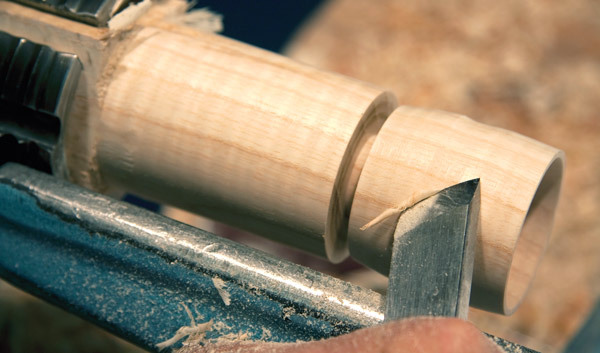 Cutting through the bowl on a bandsaw risks losing a finger unless you take care to position your hand behind the blade. As you start the cut, the saw teeth hook into the wood where it is unsupported, so you need to grip the handle very firmly and move the back of the bowl positively into the blade. When the blade is in the wood it supports the bowl, after which it’s relatively easy to pull the scoop past the blade, easing the handle around to create a smooth curve. You get one shot at this: a second cut will explode the unsupported bowl. Refine and smooth the curve on the sander. Sanding is the safest way to go. 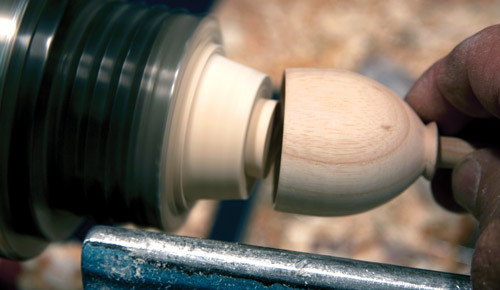 I’ve never applied a finish while a scoop is on the lathe. Mine get oiled after the cutting and sanding is done because I find dust tends to collect in the corners whilst sanding. Making these by the dozen, as I do, it’s easier to dunk them by the handful in oil, then let them drain.